Olde Keys tapestry shows the work of Acorn Studio artist, Sarah Simpson. Here we see antique keys in all their decorative beauty in an abstract scene where motifs of locks and keys as well as calligraphy are seen. The color palette is beautiful and cohesive with browns, coppers, and olives to create an old world feel. This is a delightful work full of beauty and elegance. 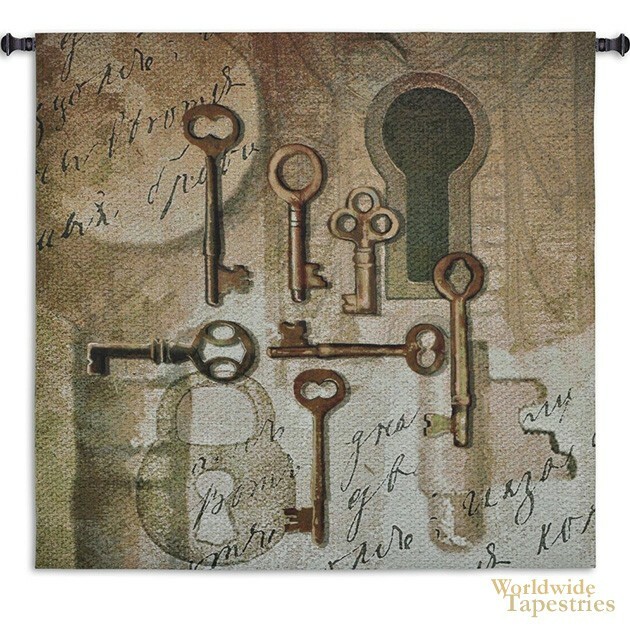 Old Keys tapestry is backed with lining and tunnel for easy hanging. Note: tapestry rod and tassels, where pictured, are not included in the price.